I had an unexpected trip last night. I was kidnapped. Good thing I had bread with me. 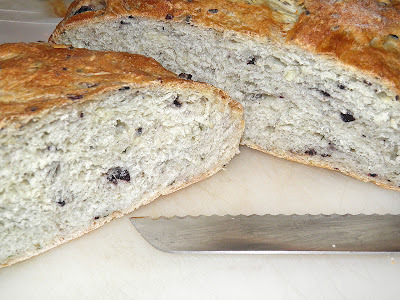 Actually I wasn’t so much kidnapped as “enlisted.” I was on my way to visit friends bearing some of this loaf and I met them as they drove down the road. They were on their way to a party just outside Mahone Bay and asked me to join them. One of the two didn’t know anyone there and wanted at least one person to talk to. So out of the blue, and uncharacteristically, I went – bread in tow. My friends said they were only going for a couple hours, so I didn’t tell my spouse who was at home. It turned into double that. I wasn’t home “late,” but it wasn’t a wise move. Lesson learned. I didn’t know what to expect when we got there. What I found was a gathering of about 30 people, luckily a few I knew from past dealings. I met other very nice and interesting people as well. Many were associated with the business and/or sailing set of Lunenburg, Mahone Bay and Halifax. The beautiful home was in a stunning location. Situated on top of a hill, the open kitchen and great room overlooked the last few islands in Mahone Bay before it opens fully to the Atlantic. It was a beautiful view, despite the night being a bit rainy. This is the dough after the first rise. 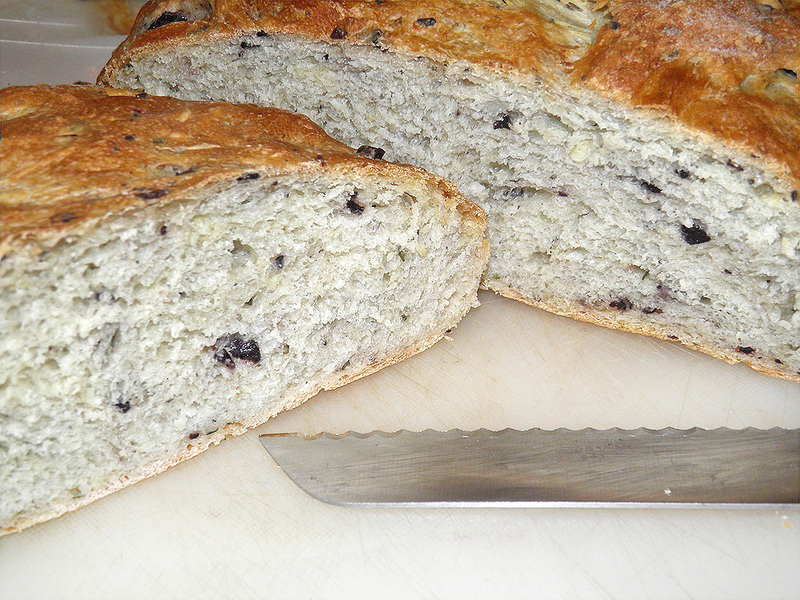 The rain played an important role in this bread, actually. All day the sky threatened showers. 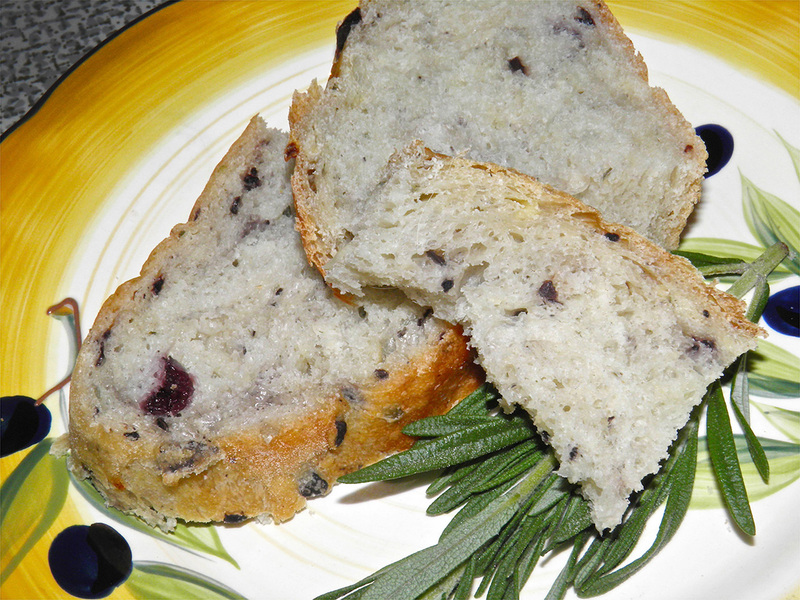 With the temperature in the mid 20°Cs that made for a fairly muggy kitchen – perfect for rising bread. As the buffet wound down and the wine kicked in my bread somehow made an appearance. I didn’t bring it out, but I was glad when it was met with rave reviews, so much so that several people asked for the recipe. So that’s why I am posting it today. It has pre-empted a few other recipes I had in the hopper. 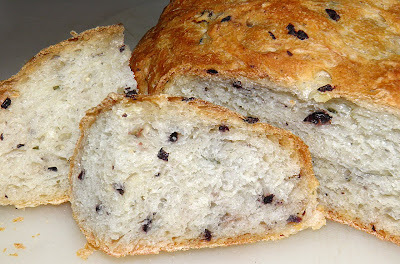 At my core I am lazy when I make bread. I hate all the kneading that is usually associated with it. By utilizing an all-day (or all night) raise you essentially eliminate that step. You're not tied to the house and you don’t even proof the yeast. It’s amazing how just a few ingredients can make something so wonderful. I went outside and snipped some fresh rosemary from the herb bed. The only other two flavourings were sweet, fresh garlic and tangy kalamata olives. The bread proofing performed amazingly well. The first rise (usually 8 hours) was done in 5; second rise finished in 1/2 hour rather than the usual 1. Conditions were obviously perfect yesterday. Fresh bread is always appreciated. If you mix together for the first rise before bedtime it will be ready before you go to work. If you do it just as you head out the door, you can have it ready by the time dinner hits the table. This bread is so moist and delicious it doesn’t even need butter. Amazing. In a large bowl, mix together the flour, yeast, sugar and salt. Stir well. Then add the olives, oil, rosemary, garlic and water. Mix vigorously with a wooden spoon to bring it together. You will not be able to knead the dough. It will be very wet. Cover with plastic wrap and then a tea towel and let rise for 5-8 hours, depending on the heat and humidity on your kitchen. 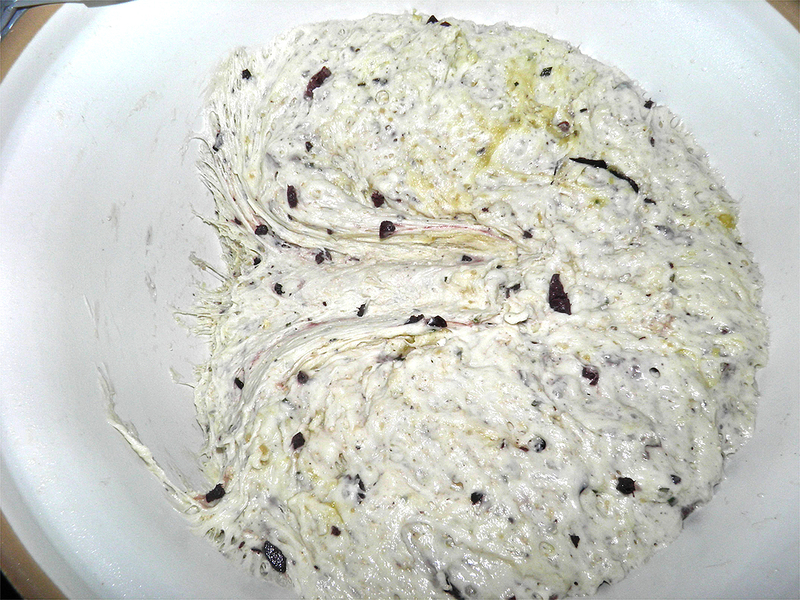 When the dough has risen you will see “spider webs” when you pull the dough from the side of the bowl. It will look like a failure, but it’s not. Once doubled, or more, pour the dough out onto a well floured board or counter. Using a dough scraper fold the dough over onto itself several times. Add just enough flour to make the dough able to be handled, but still fairly sticky. Shape into an oblong and place on a cornmeal or parchment lined baking sheet. 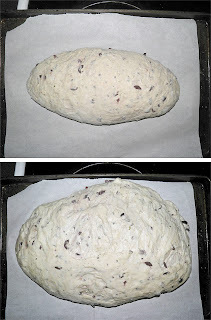 Let rise until doubled again – about 1 hour. 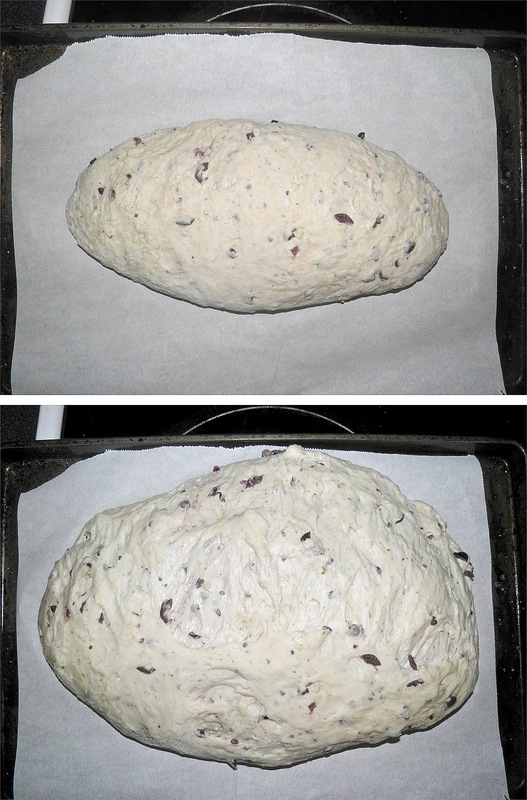 The dough will have spread out significantly. At this stage you can sprinkle rosemary leaves and large crystal salt on top. Preheat the oven to 450°F with a pan of water sitting on the bottom rack. Bake the loaf for 15 minutes. Then remove the water bath, reduce the heat to 350°F and bake for a further 20 minutes. Test for doneness and remove to a rack. The bread is done when it sounds hollow when tapped on the bottom with your fingers. The crust will soften as it cools.